Update: Gravity updated again to resolve the issue I mentioned in the last para of the post. The latest build is Build 6816 and this time, its pushed into Info and Updates section as well. I might have written it again and again, but still even you don’t get bored when I say that Gravity did it again. 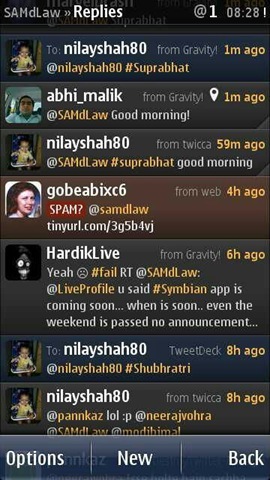 My words from past still have their validity, when I called Gravity as the biggest twitter client. We have all the reasons to say so because of continuous innovation @janole brings in it. The latest is the spam detection that was kind of biggest need of the moment and in my knowledge not implemented yet by any twitter client on any platform. The update is live since a few days now, but for the moment, I was pretty engaged in many activities and also my Nokia N8 was away from me so it was hard to post about it. Thanks for @hardiklive to push me to write and helping out with pics. 1. 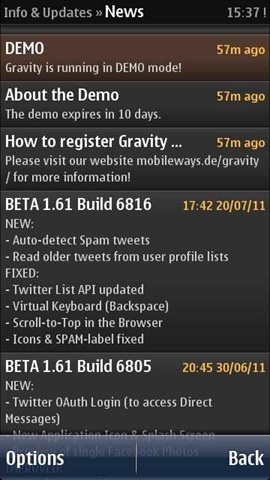 Spam detection in Gravity way: All of us who are active users of twitter must be going through it nowadays that once you discussed a line about iPad or iPhone and in next 10 seconds, you receive three four tweets from bots with a random spam link in them. Some of us dealt with such kind of spamming in our own way like typing iPad as "I p a d" or "!pad" but neither that’s a standard solution nor all the spammers are iPad or iPhone kind of.. many bots are active and attacking on different keywords. How to know that one is spammer? The tweet that mentions you will be having a link for sure, either without text or with a stupid one. If you check the timeline of the same account then you will find similar tweets as repeated. While twitter is already trying to solve the same on their own, we users can help out the community by keep on marking such creeps by using the spam or block options. 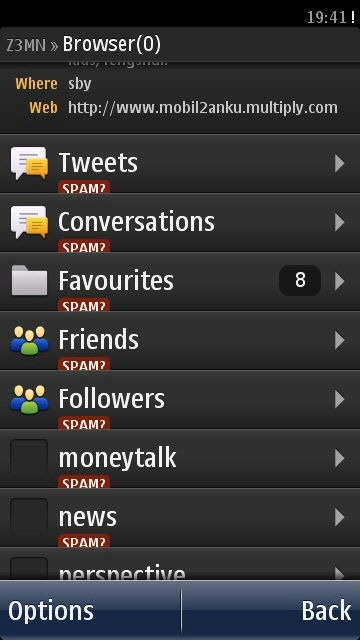 A bit of extra burden over you but it prevents you and others getting more spams from same. How Gravity build 6815 helps in it? We all seen that the name of Gravity been synonym to innovation and @janole proves it yet again with introduction of spam detection feature it his own way. The logic behind it works on the same basics like I stated in the first section. 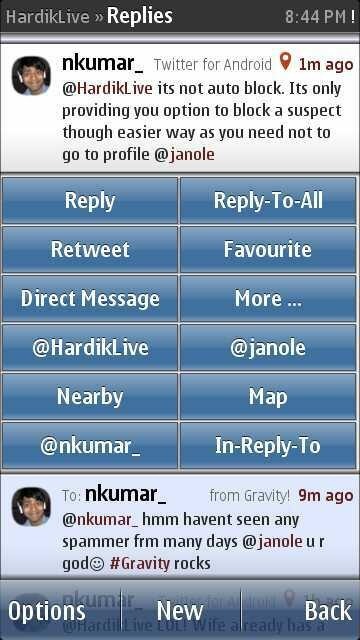 Gravity logic uses three of the four mentioned points and also checks in the tweep who mentioned you is in your friendlist or some outsider (unlikely a spammer if you following him/her). The end result is not only you can see yourself that which one is the possibly spam tweet and also can mark the same user as spam in just two steps. 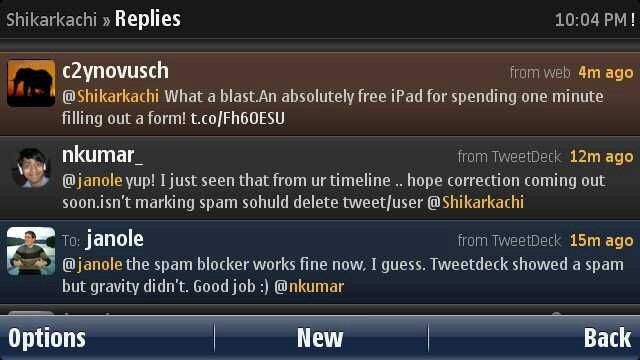 Isn’t this much cooler than earlier situation, when you were needed to go into profile of the same user and then mark it as spam? Should help many of the users as they wont be needed to go through all those steps uselessly. Reason, there is enough long text in the tweet and not only the link. 2. Geo-Tag sign changed: I think this change should not come as a surprise as once the spam icon took the place of Geo icon, the geo icon was needed to take some place elsewhere and what would have been better than the official way. Yes! as you can see Geo-tagged tweets will have an icons in right top side of the tweets than the red geo word in the start of the tweet like earlier. It takes a little time to get used of white icon on dark background though I think red or green icon would have been better. 3. Minor changes in the keyboard layout: I know many are already aware of it, though for people who are not aware, Gravity keyboard been a kind of good replica of iOS keyboard though the two icons for Back key and shift key been the different. But now, it’s exactly the same. 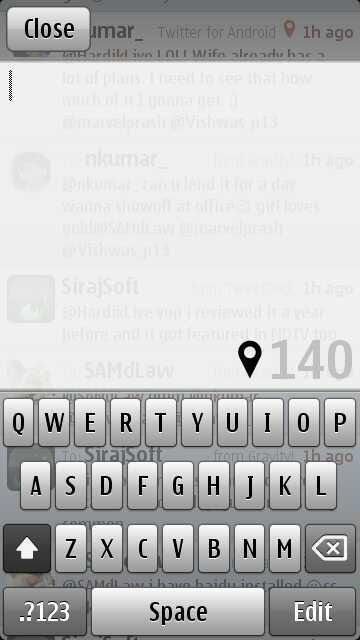 The one in the left side is iOS layout while the right one is Gravity new keyboard. 4. Minor layout fixes: As per @janole ‘s tweet as given below, there is a minor change related to fonts. Honestly I didn’t felt much of a difference about it. 6. 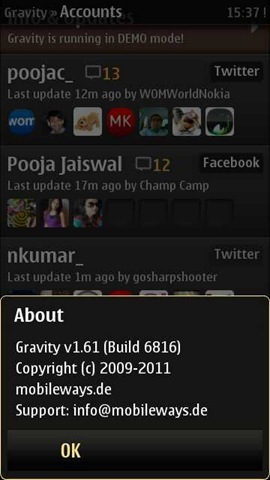 Tap on top to scroll to top in Gravity browser as well: This been a feature of Gravity since long for the timeline, mentions etc but from this version, the same feature is being extended for the Gravity Browser as well. 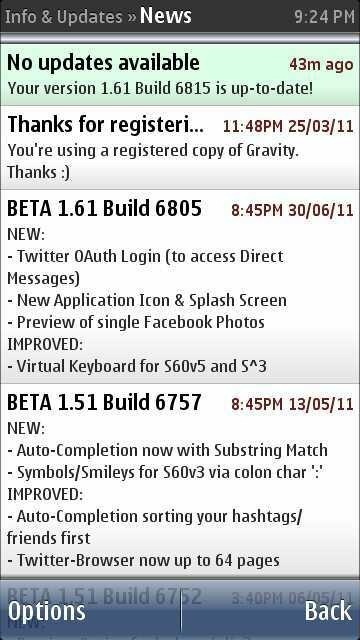 Will request you all to inform me if any additional change you noted in new Gravity and also report to @janole or me (@nkumar_) on twitter, if any bug you come across. 1. Put an option to use the built in web browser and be able to use it just like normal web browsers only using one app. 2. 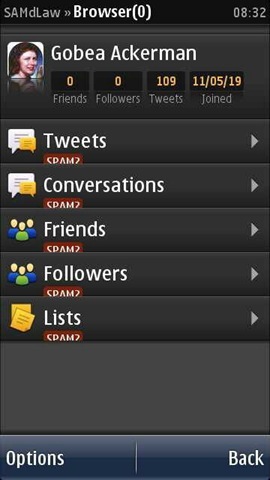 Upgrade the facebook, put mentions/tags automatically like twitter, check-in or share location. 3. Put logout in option menu or in account settings. 4. Be able to tweet longer automatically. That’s all for now! 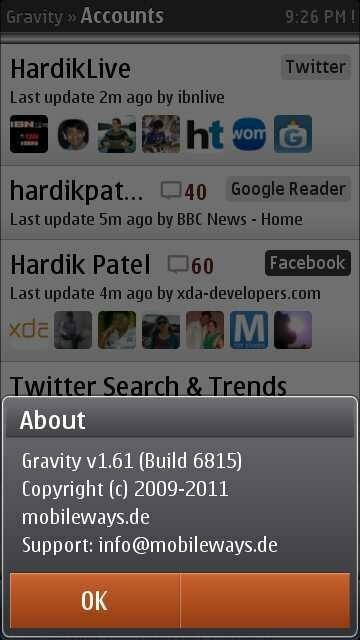 Hope to see some or all of it next build of gravity.